As we enter the fall season, children start thinking about Halloween. It’s a fun holiday, but there is a lot of opportunity for injuries, both in obvious and not so obvious ways. The White Plains accident attorneys at Worby Vecchio Edelman have years of experience handling personal injury cases of all types. Call us if you or someone you know needs this type of lawyer. There are lots of ways to avoid getting injured on Halloween. About twelve years ago – in approximately 2005 – Daylight Savings Time was extended, so that it would end in early November. The specific intent behind the legislation was to afford younger children an extra hour of daylight on Halloween. If possible, take younger children out during the late afternoon hours, while it’s still light. 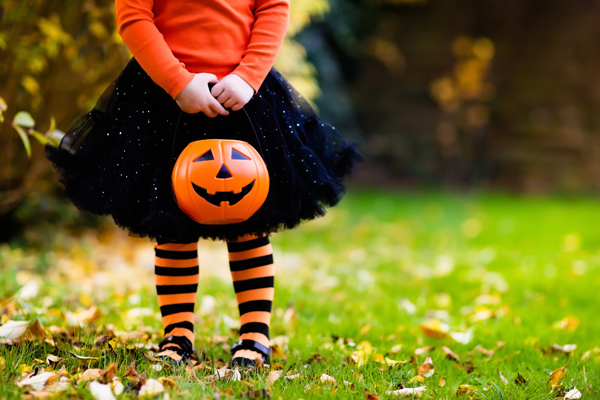 Make sure that your child’s costume is reflective, and carry a flashlight with you, so that cars can see you once it does get dark. Older kids who can go out by themselves should go with a friend. Just remind them to do sensible things like look both ways before they cross a street, and to be generally familiar with their surroundings. It’s best for kids to go to houses with which they are already familiar, but depending on the situation, that rule can probably be somewhat relaxed for older children. Some safety rules are well known. Obviously, it’s important to inspect all items in your child’s bag, and to throw out anything that’s not properly wrapped. Other rules are less obvious. If your child approaches a private home, try and be aware whether a dog resides at that premises. Dogs can be territorial, feel threatened by a strange face, and may already be agitated by the constant doorbell ringing and crowds forming around the house. There are also obvious safety procedures for drivers and homeowners. Exercise extreme caution while driving – young children are likely to be outside, and on the streets. Also, make sure that your own home is well lit and that the walkway and driveway are clear of obstructions, so that no one suffers an injury on your property. If you own a dog, try and keep the dog away from the front door. The White Plains accident attorneys at Worby Vecchio Edelman have years of experience in handling all types of personal injury cases. Taking reasonable steps to avoid an accident in the first place is always a good idea, but we’re here and available if you need us. We offer a free consultation, and we work on contingency, so we don’t charge a fee unless we are able to achieve a monetary settlement on your case, or we obtain a verdict in your favor. We’ll answer all of your questions, explain your rights, and tell you about any legal deadlines that may apply. Your phone calls will be returned, and we’ll keep you advised of the status of your case. There’s a reason why the law firm of Worby Vecchio Edelman has a stellar reputation. Call us first if you or someone close to you has been involved in any type of accident.